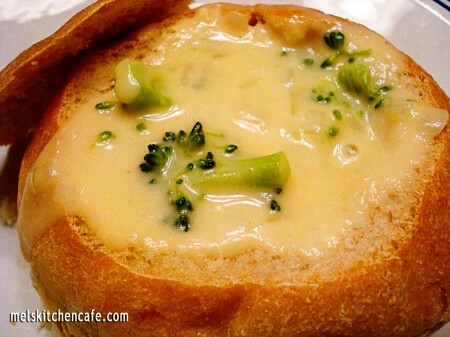 I've made broccoli cheese soups before, but I loved this one because it uses real cheese! No velveeta or processed cheeses. I liked it a lot more. I served it for my book club dinner and my mom and sister liked it too. It is a nice creamy soup to serve on a cold day to keep you warm. I served it in bread bowls for those who could eat it that way with a salad on side. 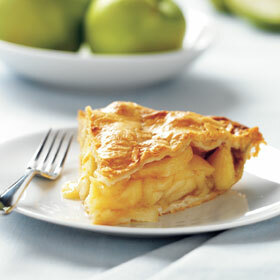 Very good and not hard to make at all. Once you have all the ingredients prepared and ready to go, it moves quickly. I did not make any changes to the recipe and it was great. I think next time I might add a bit more cheddar cheese to get the richness of that flavor even more. Simmer chicken broth and chopped onion for 15-20 minutes in a covered small saucepan, until onions are soft. Heat milk in microwave for 1-2 minutes. In a separate medium-sized stockpot, melt butter then add flour, salt and pepper. Cook together, stirring constantly, for 2 minutes, then whisk in warmed milk. Stir and heat together on medium heat until soup starts to thicken, about 5-8 minutes. Add warmed chicken broth and continue to stir until well blended. Add cheeses and stir until completely melted. Stir in seamed broccoli. Add more salt and pepper to taste, if needed. Serve immediately in bowls or bread bowls.